I had a great time reading this book. Game of Thronesy type books are all the rage lately. Warring kingdoms, political intrigue, betrayal, romance, violence, etc. If you like those things, you'll definitely enjoy this book. Lucky for me, I've never watched Game of Thrones and while I've read a few books in a similar vein, I haven't read a lot. So this book feels fun and fresh to me. Where this book really shines is a well developed gang of characters. You have Tilla, her half-brother (and lower caste) Jax, Miles (dweeb/mama's boy), Zell (scary warrior/really hot), and Lyriana (princess with hidden depths). The characters could have come off as rote and one-dimensional, but I felt the story did a good job of developing each person's story. Without getting giant info dumps, we got to understand more about each person's life and psyche throughout the book. By the end, I felt like I really understood them. I go through phases with fantasy. Currently, I'm actually in a fantasy reading slump. I just can't get interested in them. This book was an exception. I think it's because it's so fast paced, unlike a lot of fantasy novels. They had adventure after adventure. Some I expected to happen, but others took me by surprise. They aren't shielded from tragedy or violence despite their age or the YA marketing. I like that the story didn't talk down to the reader or dilute the danger of their situation. The book is an easy read. Party because of the fast pacing, but also because the dialogue feels modern. Arguably, that's somewhat clashing with the fantasy nature - or at least the old fashioned feel that we've been conditioned to think that fantasies must have. But I'm more interested in a good, easy to read story than something that perfectly fits into genre defining boxes. 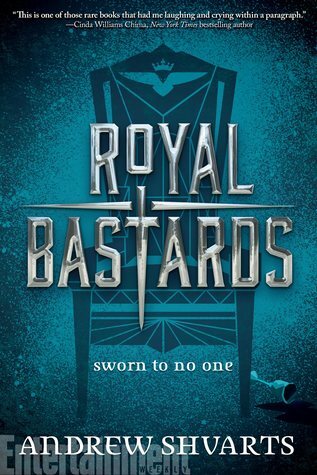 I had a great time reading Royal Bastards and look forward to more from this series.